Step by step tutorial on how to create an offline mobile app with Ionic 3, Angular 4 and SQLite using Native SQLite Plugin. Step by step tutorial on how to create an offline mobile app with Ionic 3, Angular 4 and SQLite using Ionic 3 Native SQLite Plugin. Previously we learn how to access data from API for Ionic 3 mobile app, now we have to learn how to use local database SQLite for Ionic 3 mobile app. This time we will build an expense management app, which stores income and expense data. The table will look like this. We assume that you have installed Node.js and able to run `npm` in Node.js command line (Windows) or Terminal (OS X/Linux). To make sure everything is up to date, type this command in the terminal or Node command line. Sometimes on OS X terminal need `sudo` for that command. As usual, we start tutorial from scratch or from zero. 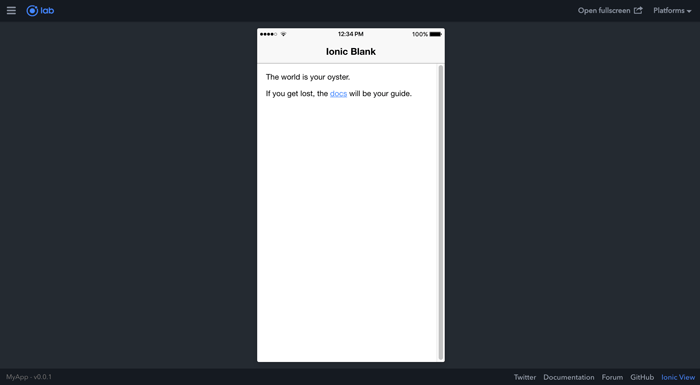 In the terminal or Node command line type this command to create a new Ionic 3 and Angular 4 app. Make sure you are in your projects folder. Go to the newly created app folder. Run the app for the browser to make sure everything working properly by type this command. If you see this page in your browser then you are ready to move. To add Ionic 3 Native SQLite and Toast plugin, just type this commands. Now, open and edit `src/app/app.module.ts` then add this imports. Add `BarcodeScanner` and `Toast` to `@NgModule` providers, so it will look like this. 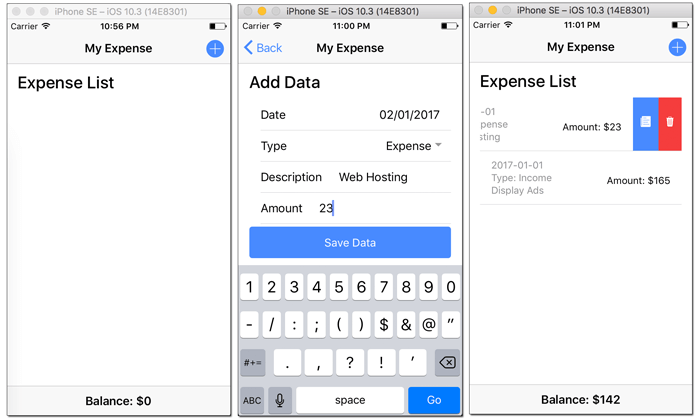 The implementation of CRUD mobile app with Ionic 3, Angular 4 and SQLite start by creating a list of expense. For that, open and edit default `src/pages/home/home.ts` then add this imports. Two imports of Add and Edit data required new pages for add and edit data that will be added later. Now, inject `SQLite` on the constructor variable. Add this variable for array of expenses, total income, total expense and balance before the constructor. Add this functions below the constructor for the complete CRUD. Next, open and edit `src/pages/home/home.html` then replace all code with this. The add button is presented by plus button on the navigation bar. The Edit and Delete button will show by sliding list item to the left. Type this command for creating a new page for adding new data. Open and edit `src/pages/add-data/add-data.ts` then replace all codes with this. Next, open and edit `src/pages/add-data/add-data.html` then replace all codes with this. Type this command for creating a new page for edit data. Open and edit `src/pages/edit-data/edit-data.ts` then replace all codes with this. Next, open and edit `src/pages/edit-data/edit-data.html` then replace all codes with this. Before running the Ionic 3, Angular 4 and SQLite app on the device, remove and add the platforms first. Now, run the app on the iOS device first by type this command. If you find the error like this. [ERROR] An error occurred while running cordova run ios (exit code 1). Then run this command to install iOS simulator inside iOS platform. Now, run again the app after back to the current folder. Now, you can test the CRUD function of the app. For Android should be the same as iOS except for UI behavior. You can run by type this command. That it's, We know this tutorial using unclean code. Maybe you can write better code than this example. You can get the full source code on our GitHub.